Dawn Gluskin, Storyteller, Mentor, Truth-Digger & Copywriter @ Blissed. Host of Bare Naked Radio. As someone who has spent the last decade fully immersed in the world of entrepreneurship, I’ve been to my share of conferences (and then some). So, while I kept hearing how magical CEO Space is, I didn’t full “get” it … until I experienced it for myself. I was immediately embraced by the community and it felt like a homecoming. When you get a bunch of high-vibe conscious entrepreneurs under one roof, it just kind of happens like that. Everybody left their ego and hierarchy at the door in the name of collaboration. It didn’t matter if you were a millionaire with decades of wild entrepreneurial success or a young start-up just trying to find your way in the business world. Every voice at the tabled mattered and, the name of the game was, “how can I serve you?” A shower of “See Me” cards was bestowed upon anybody who asked for support. What really makes this conference beyond incredible, however, is the unparalleled support of young entrepreneurs. CEO Space has an official teen program in place for ages 12 and up. In interacting with some of these teens, they are no doubt, our future leaders. But, children even younger than that are welcome to attend with their parents. (The youngest in attendance was 4-year old Ryan Gronich, who has been attending with his amazing entrepreneurial parents Shannon & Ari Gronich, since he was an infant!) I decided to take my 9 year-old daughter, Calista, out of school for the week and bring her along. My bet was she’d learn more at the conference than at school for those few days. (Spoiler alert: I was right). 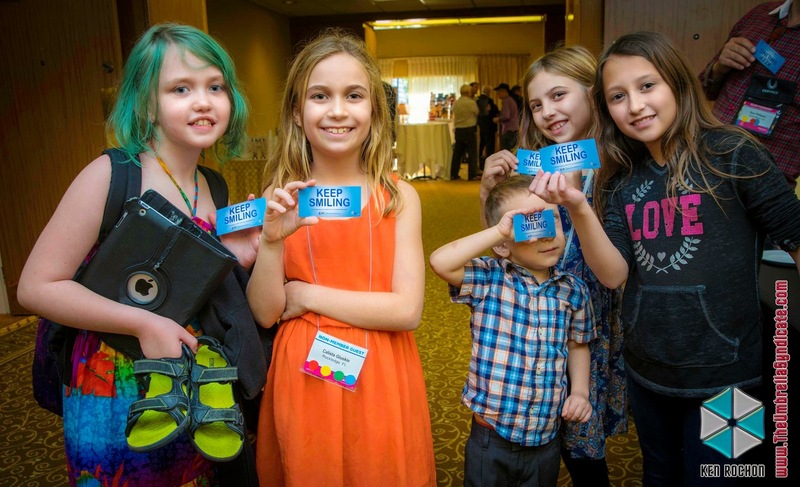 For Calista, the magic began before the conference did. On the car ride over, she expressed that she wanted to start her own business but wasn’t sure what she wanted to do. I suggested she put the intention out in the Universe and ask for guidance, assuring her the answer would come. Less than five minutes later she declared,“ I’m going to write a book about following your heart no matter what anybody else says or does.” That’s my girl! By the end of the conference, she had a full blown business idea and was up in front of the room pitching adults. She came home with 60 leads to follow up on, started a blog, and is half way through her book. What?! That’s some fast manifesting and a great example of what happens when you get into the energy and space of others who live in the land of possibility. Calista became fast friends with Neva Lee Recla, an 8-year old entrepreneur who literally grew up in CEO Space. (Her parents run two businesses: Clear Business Directory & Super Power Experts, and are long-time faculty members there). As a result, Neva hosts her own podcast, Super Power Kids, recently gave a keynote to 2,000 entrepreneurs at the WRLC conference, and is getting ready to publish her own book in support of her mission to inspire 1 million kids to do business. Whew! That’s impressive. I’m trying to remember what I was doing at age 8. Probably playing in dirt. (Not as impressive). The young entrepreneurs at the event were given plenty of opportunities to network with the adults and pitch their business ideas through what CEO Space calls “snaps.” In these snap sessions, the young entrepreneurs are treated the same as the adults and given solid business advice and real contacts to follow up with. Those who had the opportunity to get on stage and share in front of the room did so fearlessly and like nobody told them it was supposed to be difficult. Most of us grown folks can take note. Wow! Well said. Who are these children? Ask the Universe and you shall be guided. Feel your legs shake – and rock it anyway! You will come out on the other side feeling awesome. Find your tribe and the people that “get you” – they’ll carry you through. Do what you love. Other people will be drawn to that energy. Save your fears for spiders and the dark. Business should be fun. It gets to be easy, so stop making it so complicated. Part of “adulting” can look like over-analyzing and focusing on all the things that could go wrong in our business and our life. Flow and ease sounds like a lot more fun to me. Perhaps these tiny gurus know what’s up and we should all take a page out of their book. Dawn Gluskin is a truth-digger, storyteller, mentor, and copywriter that helps entrepreneurs tell their stories that need to be heard in the world. When they do, they become more visible and have a greater impact. She has over 20 years of sales and marketing experience, has been featured in the NY Times & the Huffington Post, and has written for big corporate clients such as Chase and Yahoo as well as hundreds of small businesses & entrepreneurs. She grew her first business from $0 to $3 million in revenue, at age 30. Eventually losing everything in that business and having to reinvent herself from ground zero has, thus far, been her greatest teacher in life. She knows that showing up in the world as who we really are (and not who the world wants us to be) happens to be good for business AND good for the soul. She stands for full self-expression & vulnerabilty as the means to a well-lived life on purpose. She is host of the Bare Naked Radio podcast where raw & real stories are shared to inspire others to own theirs.